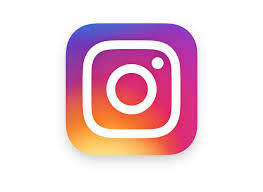 I recommend bookmarking Tracy's Blog, I've seen the some sneak peeks on amazing tags coming in the next 25 days. I'm almost ashamed to show my little tag and my effort to make a seasonal photo. Yes the Christmas Salt and Pepper pots have been dusted ready for my Christmas posts. 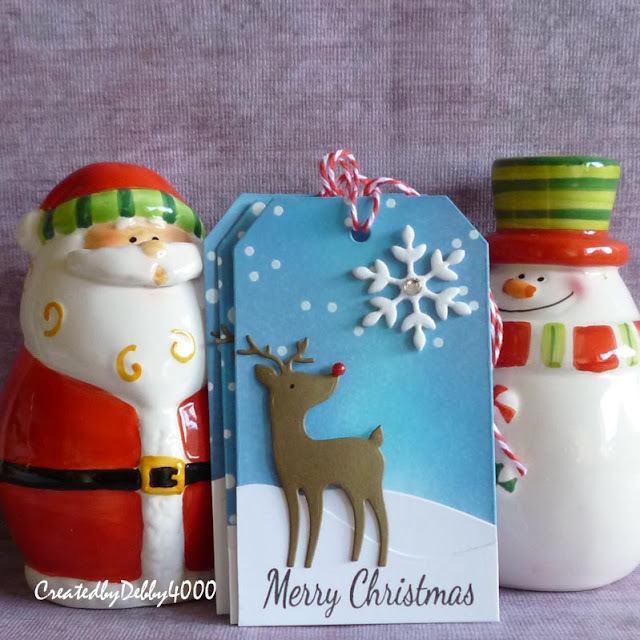 Now my cute tags are made using some Oxides but first I stamped the Simon Says Stamp Snow Falling back ground stamp with Versamark and embossed using WOW Bright White embossing powder. I then cut out my tags using the Simon Says Stamp Large Tags dies, then out came the Oxides I used Broken China. Salty Sea and Faded Jeans to make my snowy sky. My snow drifts are cut using the Simon Says Stamps Slopes and Hills dies. My cute reindeer is another die from Simon Says Stamp called Retro Deer die, just used a black pen to dot an eye and found some small red pearls for nose out of my own stash but you easily use Nuvo Drops or Liquid Pearls. To finish I've used the Simon says Stamp Stitched Flakes and added a sentiment using Simon Says Stamp Retro Christmas stamp. The back of my tags are a bit messy so I cut some more white tags to stick to the back and stamped the to and from which are also in the same stamp set. I love your tag Debbie....I am in love with the reindeer this year! Perfect tag! Beautiful sky and layout .......love this! 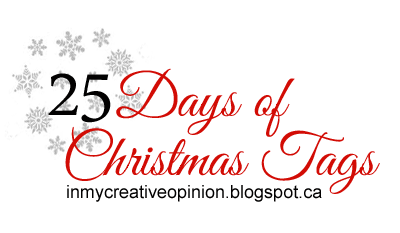 I am going to try to play along this year with the 25 Tags of Christmas. Super cute tags! I love the reindeer!! Super pretty Christmas tags! I especially love the red dot nose! Debby, these are as cute as can be - that retro deer is perfect in your sweet setting! Such a sweet and pretty tag, Debby. Thanks so much for the inspiration! This tag is totally adorable. As an S&P collector, enjoyed seeing your holiday salt and peppers shakers, too. Lovely tag, love the cute little reindeer and his red nose! What a wonderful tag, love the nose. Such a darling little tag! I really like your sweet reindeer tag! It's a great inspiration for days that I want something beautiful that I can create quickly. I usually end up making SO many tags that I am really drawn to the beautiful simplicity of the little deer in the snow! Adorable! I just love this - to have this on a present would be the perfect finishing touch. There's nothing to be ashamed of, your tag is so darn cute ! It's so adorable! I would hang it on my tree! Your tag was my favorite on today's hop! That reindeer - I love him and his cute 3D shiny nose (and added the die to my Simon Says Stamp cart too!) Thank you for the whimsical inspiration! Debby! Your tags are adorable. Why would you be ashamed? They are sweet! Great tags Debby, love Rudolph's red nose! Such a cute tag with the big snowflake. 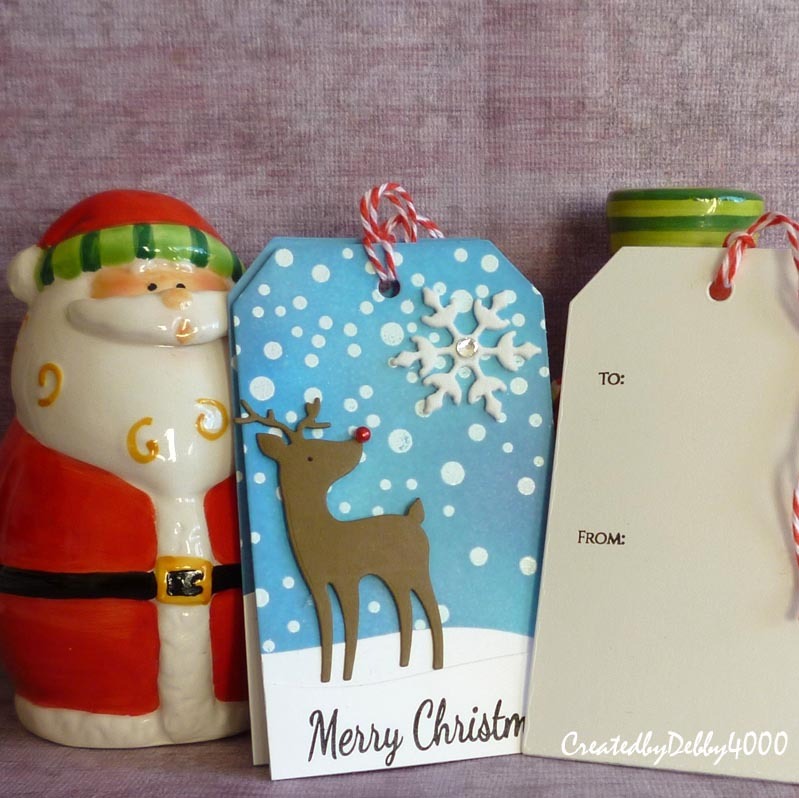 Cute tag - love the reindeer. I really like your sweet deer tag. I also like how you put the "to" and "from" on the back...now why didn't I think of that? ha-ha Thank you for the inspiration. Love your tags Debby.... cute scene and I love his red nose. Just love your Rudolph tag. It’s a great scene. I just love this reindeer die and your blended snowy scene is perfection. Love! !